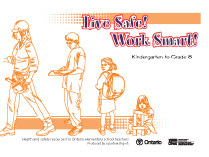 The 200-page full-colour resource, which is in both print and CD formats, will provide lessons and activities that emphasize the fundamentals of health and safety for students at home, school, work, while volunteering, and at play. All activities are curriculum-based, most meeting multiple cross-curricular expectations. Where there are existing safety-related expectations, teachers will find ready-to-use activities. Sometimes safety topics are used to meet literacy, numeracy and other expectations. Topics include backpack safety, hearing protection, electricity, germs, working with chemicals, and avoiding sprains and strains, among many others. Students learn basic health and safety concepts while developing a diverse range of skills in various subject areas. Check out the table of contents and the list of activities from the resource to see how the material is structured and the range of activities that can be used in the classroom. You'll notice that, after some introductory information and safety primers for teachers, the resource is divided into four main sections: Kindergarten, Grades 1-3, Grades 4-6 and Grades 7-8. Although activities have been grouped by grade level based on curriculum expectations, many teachers may want to select activities from various grade levels to suit the needs of their students. Educational trends and policies encourage students to think about workplace destinations as early as Grades 7 and 8. This new elementary resource provides the fundamental skills and knowledge to help students stay safe on field trips, during workplace visits, and at part time jobs. Because the K to Grade 8 resource is available on CD-ROM, not all of the files for student handouts will be available as downloads, but to give you an idea of what's in the resource, here is an overview each of the four major chapters and a sampling of activities from each. Note: The resources linked below open in a new tab/window. This 16-page chapter provides four curriculum-based, skill-building activities. Although there are only four activities, there is a variety of material for teachers to choose from. The first activity gives the teacher four exercises to choose from and the second and third activities are presented in two parts. Whenever possible, activities engage students with hands-on exercises or demonstrations by the teacher. Posture perfect (basic ergonomics) This activity is designed for students and their parents. There's a connect-the-dot exercise to give students and their parents basic information about the safe use of backpacks, along with a take-home handout with tips for using a home computer safely. This 36-page chapter provides 14 activities in the broad categories of "Identifying and Solving Problems," "Emphasis on Literacy" and "Focus on Vocabulary." In the third category puzzles and games are used to help students build vocabulary. The sample provided below is from "Identifying and Solving Problems." Don't share germs This two-part activity uses hands-on demonstrations by the teacher to show how germs can spread and how we can keep germs from spreading by using proper handwashing techniques. This 46-page chapter provides 13 activities in the broad categories of "Identifying and Solving Problems," "Emphasis on Literacy" and "Focus on Vocabulary." Activities require students to analyze information and graph results, use their artistic skills to communicate safety rules and complete puzzles drawing on their knowledge of safety vocabulary. The sample activity from this chapter is from the first section, "Analyzing and Solving Problems." Safe and sound This is a two-part activity to teach students about the hazards of noise in everyday activities. Part 1 directs you to a great website for kids and their parents that will help students use MP3 players without damaging their hearing. Part 2 teaches students about noise levels and hearing protection in situations they will be familiar with. There are also a couple of bright ideas to try in the classroom. This 74-page chapter provides 21 activities in the broad categories of "Identifying and Solving Problems," "Emphasis on Literacy" and "Focus on Vocabulary," but adds four health and safety tests to help prepare students for part-time jobs and visits to workplaces. Activities emphasize real-world situations wherever possible, and the content is more workplace-related than in the earlier chapters. The sample activity from this chapter is from the first section, "Analyzing and Solving Problems." One of the tests is also provided, along with information about a test from Passport to Safety you might like to try in the classroom. Classroom safety committee This activity provides a real-world workplace safety process in a school setting. Students are asked to elect safety representatives who help them create health and safety rules for the classroom. The representatives inspect the classroom or school for safety hazards and record them on an Inspection Checklist you can download and photocopy. To view PDF files you need Adobe© Reader© installed on your computer. Get the free Adobe Reader.